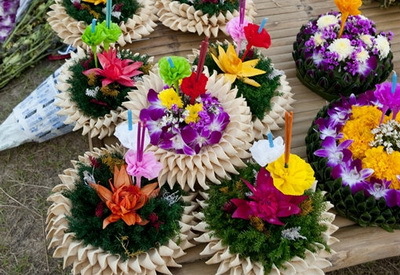 While Songkran may be the most exciting festival of the year, it is November's traditional Yi Peng that reigns as the most charming and spectacular of Chiang Mai's annual ceremonies. 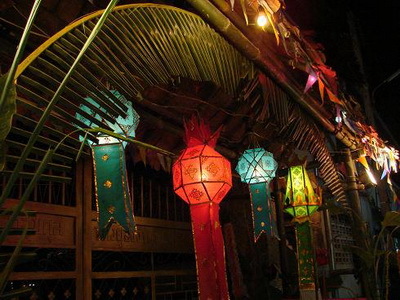 The Yi Peng festival is held on the full-moon day of the twelfth lunar month every year. The word "Yi" means "Two", and "Peng" means "Moon" or "Full moon day". People in Bangkok and other regions of Thailand refer to the event as "Loy Krathong", but here in the northern province of Lanna we call it Yi Peng or Yee Peng - and you should not miss it! The most remarkable and photogenic moment of this traditional festival is when people gather by the riverside to decorate their krathong (a banana leaf boat) with lit candles, incense, flowers and even money, before launching it onto the river. Thai people believe that this is the correct way is to beg forgiveness from the God and Goddess who protect the river. Another highlight of the festival is to launch khom loy - white Chinese lanterns - into the sky at night. Lanna folks say these floating lanterns are designed to show respect to Phra Ket Keaw Chulamani in heaven. They believe the sky-bound lanterns will carry away all their misfortunes and distress. Khom are made from thin kite paper, pasted on a circular bamboo frame, and attached with candles or wax. When lit they rise slowly into the sky. It is a wondrous feeling when you release a khom - and it is a magnificent sight to witness thousands filling the night sky at the same time. There are various legends about why Siamese and Lanna people have adopted this custom. We can not say where it began, but we do know that it is an accepted ritual across the Buddhist world these days. Despite all the beauty and excitement of the festival, it must be reiterated that millions of lanterns cause damage, accidents and litter every year. 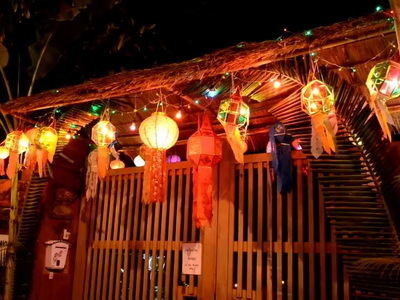 Khom loy also disturb the flight-path of aircraft and pilots' visibility. They are frequently banned in areas near airports (or flights are suspended during the day of Yi Peng). Please bear this in mind when your friends and family ask to keep lighting more and more lanterns. 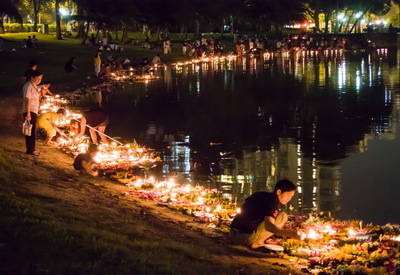 The alternative is to float a krathong on the river and to help decorate your local temple with candles. Those coming to Chiang Mai for the first time would be advised to float banana boats on the river close to Nawarat Bridge, Warorot Market, Chaimongkol Temple or in front of the Municipal Office. Lots of activities and colourful events will be going on, and it is very photogenic. Those who cannot stand crowds, noise and fireworks may want to book a table at a restaurant along the Ping River (there are dozens: see our map and listings). Then you can dine safely and still enjoy watching this aesthetic spectacle. Copyright © 2016 Chiang Mai Voyage.